Caroline Brennan, Seamie Clifford, Martin Keville, Carmel Scott Pam Scanlon, Nora Redmond, Loressa Tymon, Anne Osborne, Hugh Clancy, Alan Kelly, John Green. Each leader to decide a route and upload the route details (incl. 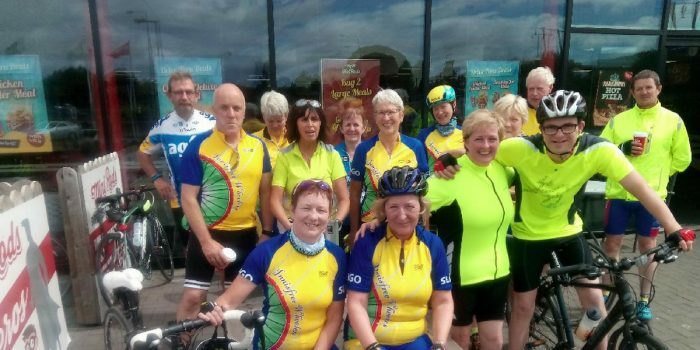 coffee stop and total distance) on Innisfree Wheelers Facebook on Fri/Sat (email the route details to facebook@innisfreewheelers.com and it will be uploaded to the Club Facebook page). Leaders to call their route again at the IT and give a safety briefing to the group before departure. ‘A’, ‘B’, ‘C’ groups are determined by the average speed/pace as outlined above. Leaders should ensure, insofar as possible, that group participants are evenly matched before the spin commences, to enable riders to stay together on the road.